“I got the entire promotional kit for the [Hallicrafters] S120 when I was a kid. My parents even bought the radio for me. I still have everything, including the record. How could you not want to get into SWL after listening to it? Thanks for sharing, Ken! This stuff is priceless. This entry was posted in Boat Anchors, Nostalgia, Radios, Videos and tagged Hallicrafters, Hallicrafters S-120, Kenn Carr on January 12, 2014 by Thomas. Ed McCorry’s radio story is the latest in a new series called Listener Posts, where I will place all of your personal radio histories. If you would like to add your story to the mix, simply send your story by email! How did I get my start in SWL’ing? Well I suppose it was a lot like many other people way back in the 60’s. As I remember, I was always a tinkerer with a keen interest in all things electrical, taking things apart and putting them back together, not always without modification or in working order. I was a freshman in high school (1962) and was working on a project with a classmate at his house one day and found out he was a ham. I had heard about this but this was the first time I had met someone who had radio equipment. He was new to the hobby and had a Hallicrafters S-120 receiver (didn’t everyone?) and a Morse code transmitter. He showed me how it worked and we listened for awhile and I was hooked. Back in those days living in New Jersey, we had a black and white TV and received the three major network feeds and a few independents from New York. The stations went off the air sometime around two in the morning and there wasn’t a whole lot to watch anyway so I was always looking for something to do. Shortwave radio was the answer! Like a lot of other families back then we had all the necessities we needed but there wasn’t any extra money to go buy a radio (the S-120 cost $65.00, a weeks pay). Well by doing odd jobs and mowing lawns I was able to save up to buy a used 4 band shortwave radio for $25.00 (can’t remember the brand). I threw some wire out of the window for an antenna and I was in business. I would listen for hours to places I had only read about. Little did I know then that it would still be a hobby when I was 65 years old! 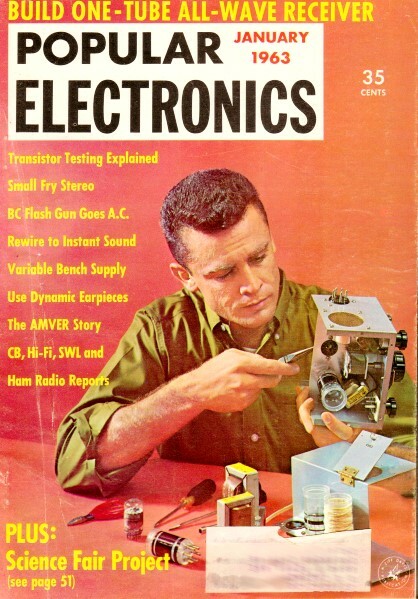 From there I started reading Popular Electronics where Hank Bennett had a shortwave column, registered SWL’s and gave out call signs. Mine was WPE2PNH. From that column I learned how to send reception reports and get QSL cards. There were so many stations back then. I got a job after school and finally had the money to go buy that S-120. Meanwhile I was taking electronics in school and building some of the simpler projects from PE. After High School I was in the military for the next 8 years and had the S-120 with me when I was in the States but between going to Viet Nam and Thailand for 3 years and everything else going on there wasn’t much time for SWL’ing. However, I did build my first of around 30 Heathkits back then. It was a Q-Multiplier for the S-120. After I left the service I got back into listening and in 1978 I wrote Hank Bennett who had left PE and started his own SWL registration and he changed my call sign to WDX2PNH (still have the certificate on the wall). I was never interested enough in all those years to go get my ham ticket until I was on a Search and Rescue team in 1995 that required it. So I received my Technician license, KI4QDE, and until recently spent much more time listening than talking. I’m pretty much 2 meters but I will probably upgrade to General in the near future as it seems that there is less to listen to month after month with the BCB stations cutting short wave. Many thanks, Ed, for sharing your story! Click here to read our growing collection of Listener Posts! This entry was posted in Listener Posts, Nostalgia and tagged Ed McCorry, Ed McCorry KI4QDE WDX2PNH, Hallicrafters S-120, Listener Posts, Radio Stories on October 27, 2013 by Thomas.